I’ve heard dozens of variations on that recommendation in my task design workshops. I heard it at Twitter Math Camp this summer. That statement measures tasks along one axis only: the realness of the world of the problem. But teachers report time and again that these tasks don’t measurably move the needle on student engagement in challenging mathematics. They’re real world, so students are disarmed of their usual question, “When will I ever use this?” But the questions are still boring. That’s because there is a second axis we focus on less. That axis looks at work. It looks at what students do. That work can be real or fake also. The fake work is narrowly focused on precise, abstract, formal calculation. It’s necessary but it interests students less. It interests the world less also. Real work – interesting work, the sort of work students might like to do later in life – involves problem formulation and question development. We overrate student interest in doing fake work in the real world. We underrate student interest in doing real work in the fake world. There is so much gold in that top-left quadrant. There is much less gold than we think in the bottom-right. This is a series about “developing the question” in math class. @ddmeyer @mpershan my kids working with http://t.co/ig98dLeSGS are doing real work, fake world, and loving it. I would add that tasks in the bottom-right quadrant, those designed with a “SIMS world” premise, provide less transfer to the abstract than teachers hope during the lesson design process. This becomes counter-productive when a seemingly “progressive” lesson doesn’t produce the intended result on tests, then we go back not only to square 1, but square -5. I love this distinction between real world and real work, but I wonder about methods for incorporating feedback into real work problems. In my experience, students continue to look at most problems as “fake” so long as they depend on the teacher (or an answer key or even other students) to let them know which answers are better than others. We like to use tasks such as “Write algebraic functions for the percent intensity of red and green light, r=f(t) and g=f(t), to make the on-screen color box change smoothly from black to bright yellow in 10 seconds.” Adding the direct, immediate feedback of watching the colors change makes the task much more real and motivating. I have to agree with you. I call them “contrived” problems and not “fake” ones. When the problems are real, the students can see a need for exercises to help them understand how the mathematics works to solve the real one. Many times the problems assigned are so simplified that students know they are fake. With the power of technology students can seek help solving almost any problem. You’re totally on-point here Dan, and I would add that tasks in the bottom-right quadrant, those designed with a “SIMS world” premise, provide less transfer to the abstract than teachers hope during the lesson design process. This becomes counter-productive when a seemingly “progressive” lesson doesn’t produce the intended result on tests, then we go back not only to square 1, but square -5. But how then do you propose that living-breathing-world contexts enter the conversation? Say I start off with your top-left quadrant challenge, and we hold a rich discussion which hopefully leads to symbolic representation and abstraction. Is the next step then “Can you think of any situations where this pattern would be useful” and brainstorm? Maybe the stat teacher in me is always looking for data modeling hooks. Top right: … and how might they be related to each other? Also, the usual way of involving the “real world” is to search for problems which will generate examples for the current topic being taught. It seems to me that finding interesting concrete problems from anywhere and at any level, and then doing a preliminary sorting. Problems can then be dropped on students, with suggestions, guidance, simplification from the teacher. Real concrete problems do not have “use this method” labels attached to them. But how then do you propose that living-breathing-world contexts enter the conversation? From the start, perhaps. I’m not implying an ideal ordering of these quadrants. I’m just tired of seeing tasks evaluated in one dimension only – the “realness” of their context. This brings me back to my current view when I look at problem or worksheets Dan: Cutting out what you don’t need. It really is amazing to me that some problems that I thought were good this summer I am now looking at with a slightly different view. Right now, I am exploring the avenue of getting student input and conversation about things, then working to move that discussion to student justification and inquiry. I usually start the year off with graphs, but I approach it from the function- I look at the graph first. How different would this problem become if students look at a graph with the y intercept at 200 and increasing at a steady rate. Ask students to describe what the graph is doing generally (it’s going up), then ask them to create a story for what the graph is showing. For the sake of Dan’s example let’s say the students say cell phone costs (although I really doubt that will be the first thing they think of), then ask them to get specific. Where does the graph “start”, what does that mean in your story? What is the graph doing and how does that influence your graph? 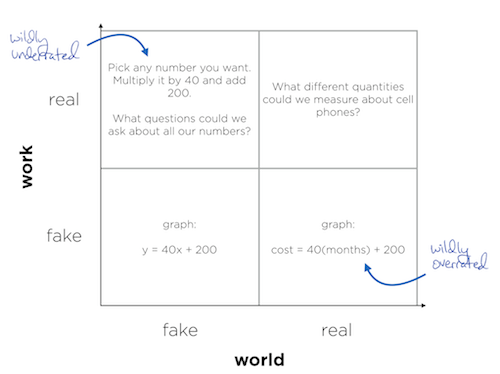 Students can provide the “fake” math and “real” math, giving you a story that is important to them and the mathematics that can occur within that scenario. You don’t have to spend hours designing a story that flops in the first 3 minutes of class. Place yourself farther back in the spotlight and I have found my students are more than willing and capable of standing in it. Less is more- that’s becoming my philosophy. So for me – “real” on both axis means meaning. Top-left work has meaning because what I am thinking about provides insight into something larger. A universal truth – if you will – about the number system that is transferable and related to the big ideas that govern reasoning. Kids know what that feels like. There’s other stuff in that paper, but that framework helped him better understand why a question like, “If there are 4 rows of 23 people sitting at the football game, how many people are there total?” is quite different from “If your team is losing 28 to 10, how many ways can you score to tie the game?” For the first question, while it’s set in a “real world” context, it really isn’t the kind of math we do at football games. The second question is math we do at football games, however, and therefore it has a certain authenticity that the first doesn’t. A ‘real’ problem presented without context and utility can seem artificial even if it is not. How long will it take for a gas to flow out of a container given a certain hole size and the internal and external pressures? How long will it take for a tire to go flat? The question isn’t just: Is the problem real? What engages students is: Does the answer provide useful information? AMEN! Thank you for making this point. I whole-heartedly agree and will be using this discussion with my instructional coaches and teachers. Good point and theory. Have you seen Paul Dowling’s work ‘Sociology of Mathematics – Chapter 6’ which has a similar feel? Also, what’s the deal with mobile phones? @Raymond & Rebecca, thanks for the citation. Added to the pile! My recent writing has focused on methods for setting up a task so that the work is more meaningful (or “real”) to students. Your comment describes how the validation of the work (the answer) can make the work seem more or less real. You Don’t Have To Be The Answer Key.. I had students bored or engaged in all of the four quadrants you drew. Recently, I had students really engaged in doing real-world Math. Because they saw abstract algebra makes sense (is *meaning-full*) in the real world *they* were going to experience in a few hours or days. BTW: what’s interesting for them is interesting for me too. Because they’re my students. One should immediately dispense with the notion that you can find a single strategy that will work with all students. If they all come from the same place and are going to the same place, it might be possible, otherwise, you are trying to make it easy on yourself. Segregating students according to learning styles is difficult, but may be the only way to prepare effective materials. Otherwise, we simply accept that some percentage are not going to “get it”. This is where online curricula could shine by presenting multiple approaches to learning how to do something. Just thinking out loud here in the five minutes I have before I put the laundry in. “Real” is a sucky word. Like “love.” I long for German at these times. “Authentic” is marginally better– this is the moniker my current employer, Expeditionary Learning, uses– but can still be opaque. So what is authentic work for kids? I’d suggest the following three criteria, which can be combined or targeted in multiple configurations, or singly. 1) Authentic work is work that *does something*. It makes something tick; moves something forward; it has measurable, tangible agency. Fred’s example of the colors changing satisifies this criteria. 2) Authentic work is work that has agency (building on #1) *outside of school. * That is to say, it is a task set up to reasonably approximate mathematical (or verbal) challenges a person will actually encounter once they complete their formal training in an educational setting. Fred’s example does not satisfy this criteria (and neither do most school tasks) but as I allude to above, I don’t think that’s necessarily a deal-breaker. 3) Lastly, authentic work is work that has *personal meaning for the student. * I see this definition latent in many of the comments on this post: kids find the work “interesting” or “meaningful,” etc. In otherwords, they “care” about it. Of course, this criteria is the most simply worded, and the most complex of the three. Read: intrinsic versus extrinsic motivation, “I find joy in this work” versus “My dad grounds me if I don’t get A’s,” and so on. And, most challenging of all, once the teacher has done her level best to elicit that caring, whether it exists or not it is completely out of her hands. Like Dina, I generally prefer the term “authentic” over “real” and that is the word we normally use. I hope I am not being overly defensive on her important point #2, but it is an issue we encounter very often when we try to coordinate science, technology, engineering and math (STEM). I remember one technology-oriented administrator who felt that geometry could only be “authentic” if students learned it while operating actual CNC machine tools. Unfortunately, even that is not entirely “authentic,” since almost no students will ever operate precisely the same equipment to do precisely the same thing outside of school. I consider that level of “authenticity” to be job training, not education. As for my example of students programming color changes, in our activity students enter Excel-like functions into an Excel-like empty box. I feel there IS a very high probability that students will do similar tasks outside of school. Some may actually become engaged in jobs or hobbies that involve comparing linear and non-linear color changes in connection with graphic design or video editing. I think the activity does meet Dina’s criteria 2. We also hear some students express surprise and a new level of enthusiasm when they realize there can be a connection between algebra and art–providing personal meaning for at least a few students who previously felt alienated from math. Math Machines is a non-profit and the Color Functions software and activity guides are free. I would much appreciate feedback from anyone willing to try them. Before one goes too far in trying to make math “real world”, one should understand what math is: an attempt to analyze and predict what nature does automatically. The planets do not need Kepler’s laws to remain in their orbits. Man needs Kepler’s laws to understand the motion of planets. All math does not have “real” equivalents. What is the real world equivalent of the square root of -1? … of an infinite series? … of Fibonacci’s numbers? The point is that math is a tool we use to analyze the world around us, and man compartmentalizes mathematics (algebra, geometry, calculus, etc.) because reality is complex and requires complicated tools to understand it. Some parts of these tools can be applied to the real world and some are just used to understand the next tool that is needed to understand something more complex. I don’t understand the work dimension. In the description it’s described as “The fake work is narrowly focused on precise, abstract, formal calculation.” and then followed by “It’s necessary but it interests students less.”. What is the relation between those two things? Do you mean that students are motivated by some tasks and not by others? Why call that fake and real? Any way, I feel the whole left side is underrated and right side overrated. Abstract, interesting puzzles with no relation to anything remotely ‘real’ *can* be very interesting and challenging for students, while with only posing supposedly real ‘problems’ interest can dwindle quickly. It’s about balance. As always. @ Robert, I think some of the other dimensions are puzzling/not puzzling, as Dan writes about in the Related post, and whimsy. In Creating Innovators, there is a quote from Ed Carryer of the Smart Product Design Lab at Stanford. He says, “Having an element of whimsy in the project is really highly motivational. If you give them a task that has a real and obvious connection to some industrial thing, it doesn’t feel like it’s fun to do.” I don’t worship fun, but given a choice, asking them to do real work to find pirate treasure may be a better hook than asking them to do real work for a local company. Or maybe not. @ Dina, I think you are confusing “work” with “world”. My understanding is that a fake work problem is one in which the actual work the students do is so scaffolded or isolated that it removes all decision-making and complexity. A problem could have to do with leprechauns (or number theory) and still require a great deal of real work. For my money, real work is much more important than real world. We don’t know what jobs students will end up in. What we do know is that math skills (fluency, concepts, tools), well-learned, are universally applicable, so that’s what we should be teaching and practicing…as broad and robust an application of math as we have time for. @Dina, I don’t mind changing the naming here or even arguing over what the naming should signify. At this point, any argument that pulls focus away from the colorful wrapper surrounding the work and draws attention to the work instead is fine by me. But like Fred, I’m most uneasy with your second criterion. I can’t do better than to echo his concerns about a) the shifting sands on which we find these job connections and b) the reduction of math education to job training. If we adapted the same criterion to language and composition, where would we find poetry? Would we only read technical manuals and write cover letters? Really like the image and insight Dan. Thanks! Love this pushback. Thanks, everyone. I don’t know whether I wasn’t clear enough (probably– my apologies) or whether Webworld causes us to read too fast (yes) or whether I have stumbled onto a sore point with mathematicians (similar to poets, as Dan points out)– perhaps all three?– but if you’ll read my original comment, you’ll see that I don’t think my second criterion is a categorical imperative. Rather, any of the three strike me as a defensible definition of “authentic.” I believe this leaves room for calculus, owner’s manuals, the times tables and poetry alike. I wish our education system could as well. Is math regularly criticized as “not the real world?” I am super curious about this, given the heat the humanities is getting these days for the same damn thing. Only every day. Otherwise you’d find me doing something more productive than writing these correctives every other day. I’d love to hear more about this particular critique of math (@Dan and @thread commenters one and all): its sources, its arguments, its answers. Just fascinated. Obviously the questions that we ask, in the limited time we are given, is so important to us as teachers in order to make sure not only the students can understand the lesson, but also that they can transfer their knowledge to other similar tasks. I always get frustrated when I talk to non-teacher friends who give me advice because I am a teacher in training, who say that I need to make my content relevant. But in all honesty most of what I teach will not be used by any student in the class, so I want them to more importantly understand how to use simple definitions and truths to create knowledge for themselves. Working from the abstract and open ended allows for students to create a world of math instead of being told what it looks like, and you illustrated it so well with your post and diagrams. What in heavens does that mean? Math is a tool for helping man understand and predict the world around him. If it isn’t, why are we studying it? All math does not produce the final answer, but if it isn’t a stepping stone, what use is it? We used a “fake” problem, but removed all of the normal parameters and allowed the students to turn it into a “real” problem. By presenting the problem below to the students, they students created the reasons for their calculations and brought their life and experiences into their solutions. The original problem gave the students certain time frames to work with, certain spending limits, and lots of follow-up questions to guide them to a single, direct answer. I expected students to say things such as, “My parents bought my phone and pay for it, so I’d get the Smartphone and the Unlimited plan.”, or “I have to pay for my monthly bill, but my parents bought the phone, so I’d get the smartphone with the basic plan.”, etc. One student said that he would never buy a smartphone because he just bought one and then broke it in the first 6 months and now he had to wait for the end of his contract to come up in 1.5 years to get another one. Then, he changed his mind and said that he’d get the smartphone, but would buy a LifeProof case. He promptly researched the cost of that and included it into his final solution. This lesson was a great way for students to see the math in action as well as work on their operations with rational numbers. Mohammad’s mom has said he can get a cell phone, what is the best deal? I love this discussion and agree with most of the points Dan made. I try to provide a real world context to most of the “anchor problems” I use with students but I agree that it’s the approach and intention of the problem–the focus on PROBLEM SOLVING that makes the difference. Most of my students come to me in 9th grade hating math. The describe middle school experiences where they were showed how to do a problem and then asked to do 30 more on their own–as clueless about the content when they ended as when they started and then lost when the class moved on. It usually takes nearly a year of work to get students to see that there really is no one right answer to the problems we work on. That’s when things change. When students really believe me that I care more about the process than the product (and that they should too) they start to TRUST math. And, it turns out, they start to get good at it too. For me, the upper left quadrant simply exemplifies the connection that math has to its origins in philosophy and that there was never any need for “real world” applications. I guess what I’m saying is that I see no real world in that upper left quadrant, I complicated, esoteric, abstract thinking about things that expand and inspire new ideas. The words, “real world” are past their usefulness and should be replaced by “thinking”. I believe that it is important to have authentic problems for students to understand how what they are learning relates to what they will encounter outside of the classroom. At the same time it is important for students to practice skills in order to be able to formulate problems and questions. In order for students to feel comfortable asking further questions about a topic and then developing a way to find the answer to that question the student need to have a strong grasp of their basic skills, which seem to be where many are getting held up. So, if students understand that their problem solving skills and basic numeracy skills ore connected and are needed to solve real life authentic problems they are more likely to be engaged and show a willingness to learn. “Engages the Student” and “The Learning Has Value to the Student”. When in the quadrant when both are ‘yes’ then the learning is most effective. What is difficult is that what engages a student is different for each student, and can be different for the same student at different times. Sometimes they see the relevance because it applies to a current job or issue. Or they get hooked by stimulating their curiosity or competitive juices. Or they created their own interest because they created the question. The problem is when we are working outside of that most effective quadrant. Pingback: dy/dan » Blog Archive » Can Sports Save Math? Pingback: Math Band: Are You Teaching Students To Cover or Compose?